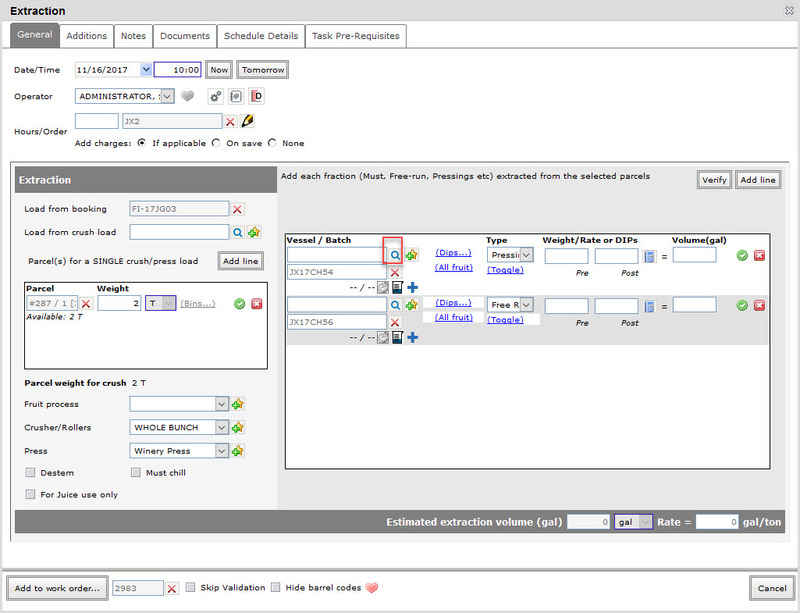 The Equipment schedule console is only available for vintrace Enterprise subscription. For more information on the Equipment schedule console please click here. Below is a sample schedule for fermenters. In order to create the schedule above, firstly, you need to create a resource group for fermenters. Go to the Equipment schedule console. Click on the add button to create a new schedule group. 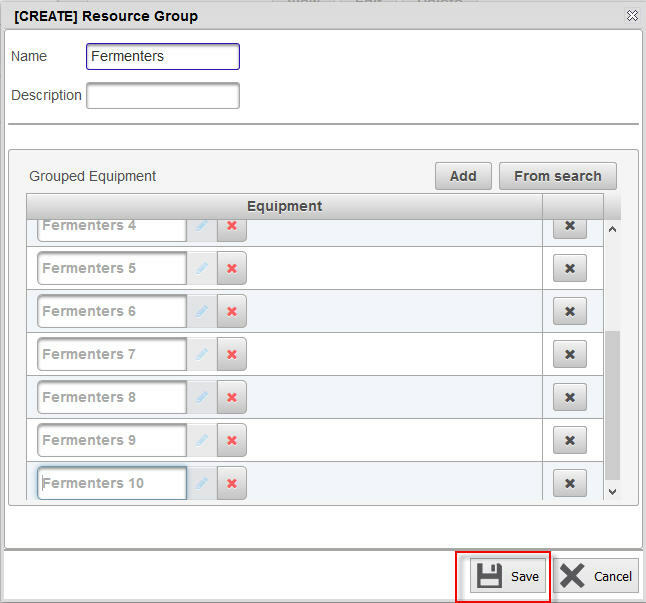 Create a new resource group for fermenters. Give your resource group a meaningful name. In the example below, we have given the name “Fermenters”. 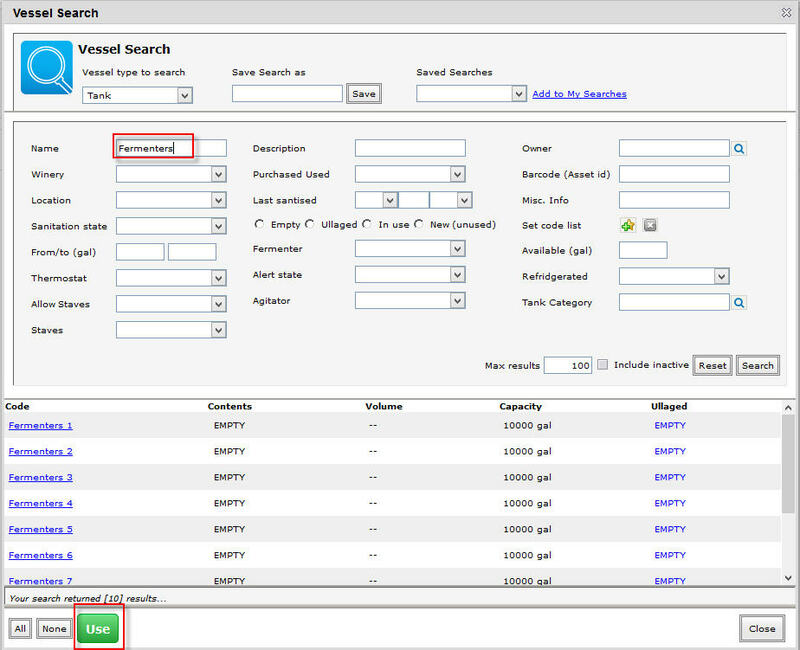 Click on either Add button to add the equipment one by one or you can click on From search button to go to the Vessel search screen and select multiple vessels from there. Tip: You can use the From search button to add multiple vessels in one go. In the example below, we clicked on From search button. 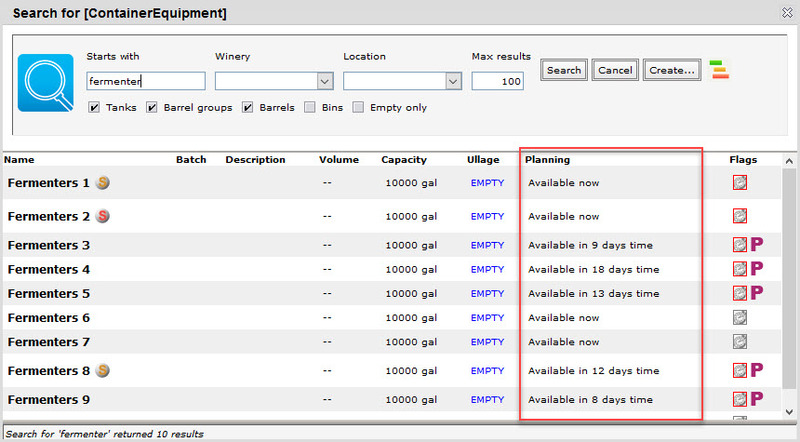 In the Vessel search screen, search for your fermenters then click on Use button. All the 10 fermenters are added into the resource group. Click on Save button. Your schedule group is created and you can see the fermenters you have added in the timeline view. Below is an example of the fermenters resource group that already have planned usages. When scheduling work orders, you can now specify how long the wine will be in the tank and it will automatically generate a planned usage for that vessel in the Equipment schedule console. For this example we will be creating the planned usages for your fermenters by scheduling an extraction job, and then scheduling an addition job against them. 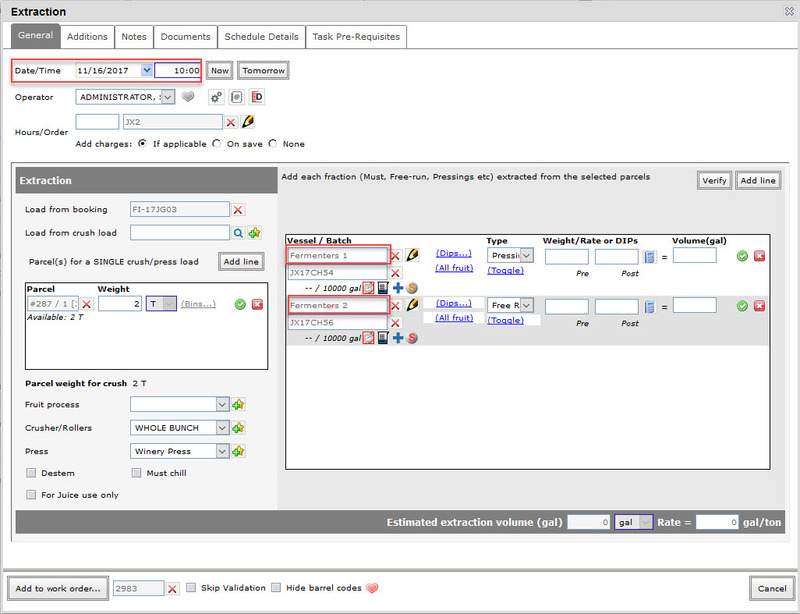 Firstly, you need to create your extraction work order for your fermenters. Go to File menu – Work order from writer – Add job – Extraction. Enter the date/time you want to schedule the operation, and select your fermenters as the destination vessels. One fermenter will be the pressings tank and the other one will be the free run tank. Please click here for more information on the extraction operation. Tip: You can use a work order template to create the extraction and addition work orders and generate the planned usages in one go. Please click here on how to build work order templates. When you search for vessels to add to your extraction work order, you will be able to see which vessels are available for use. In the Search screen, the availability of the vessels are shown under the Planning column. Alternatively, you can click on the planning icon on the upper right corner to see the Equipment schedule console and click on Use button on the available vessel you want to select for the operation. After you have selected the vessels, select the date and time you want to schedule the job. Then click on the Schedule Details tab. This will bring up the Schedule details screen. Here you can provide estimates on how long you expect the vessel to be in use to help you visually plan work on the Equipment schedule console. 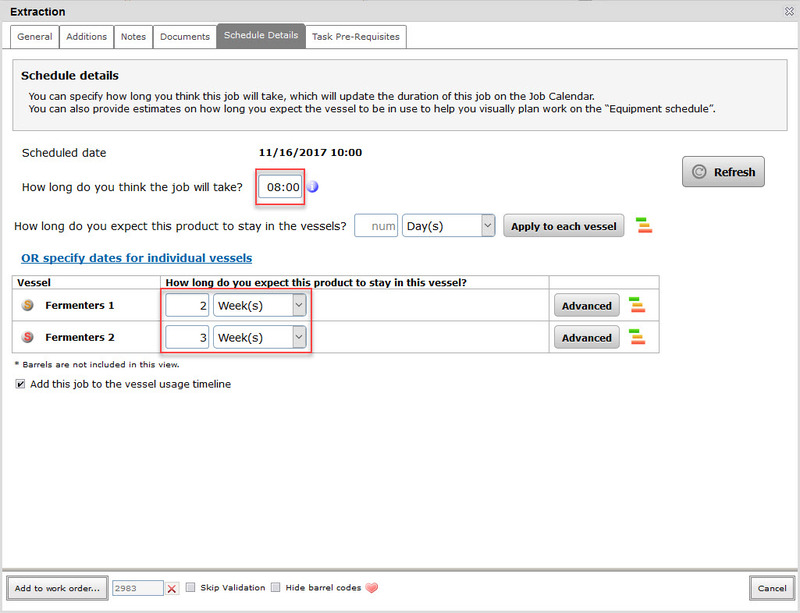 1 Expected duration field (hh:mm) – this field allows you to enter how many hours you expect the job to last. 2 How long do you expect this product to stay in vessel (days, weeks, months, years) – the estimated duration for all the vessels in the list on how long you expect the vessel to be in use. Click on Apply to each vessel button after you have entered the values. 3 Enter the estimated duration for each vessel to be in use here if you want to specify the duration individually for each vessel. Click here to learn how you can set this field to be mandatory upon scheduling or completing jobs. 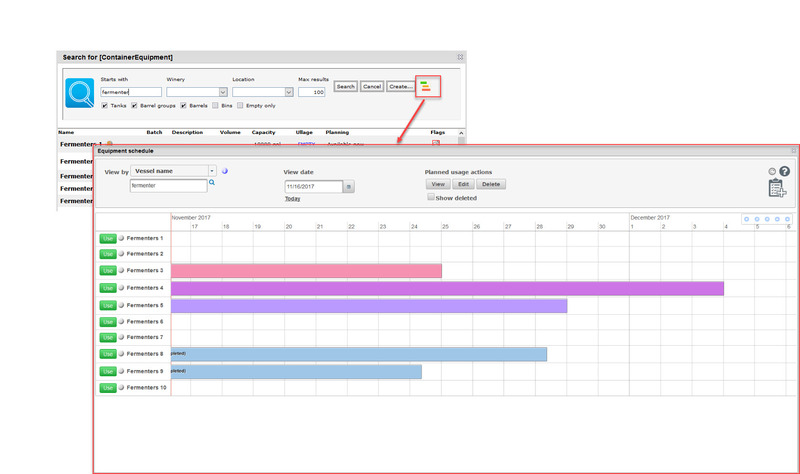 4 Advanced – brings up the Planned usage screen when you want to manually create the planned usage. 5 Equipment schedule – brings up the Equipment schedule console for the vessel so you can see if there are any other planned usages for the vessel. In the example below, we have entered that the extraction task will take 8 hours, and the vessels will be in use for 2 weeks. Then click on the Add to work order button to save the work order. 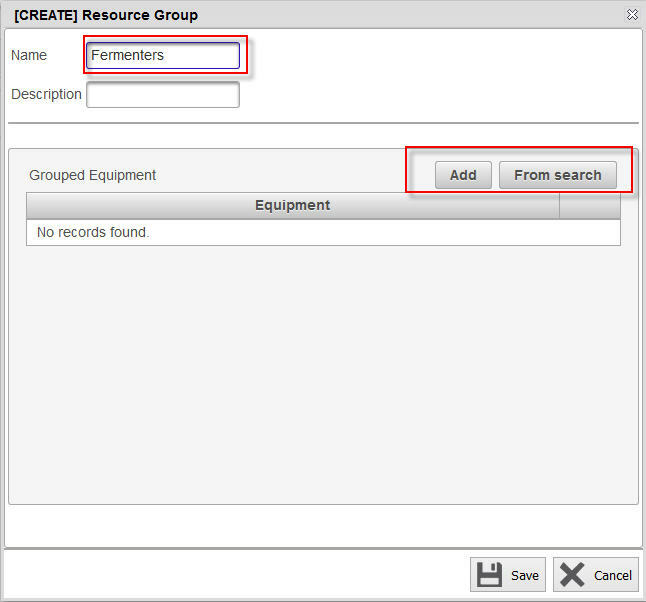 Go to the Equipment schedule console and select your “Fermenters” resource group. 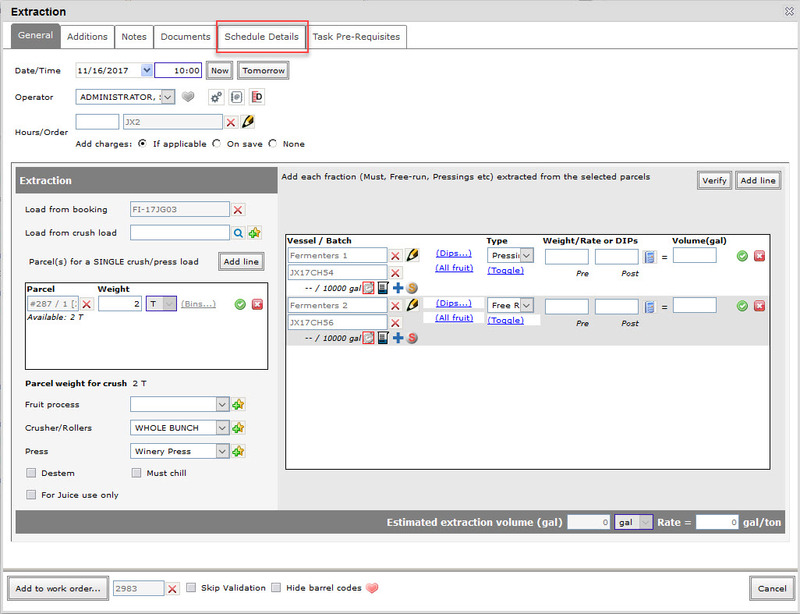 Planned usages have been automatically created for for both fermenters that starts on the 16th November. Important note: The auto creation of planned usages will only be for tanks on the destination side of any transfer, multi transfers, extraction, or press cycle jobs. Clicking on any of the the planned usage will show you the extraction work order you have created. 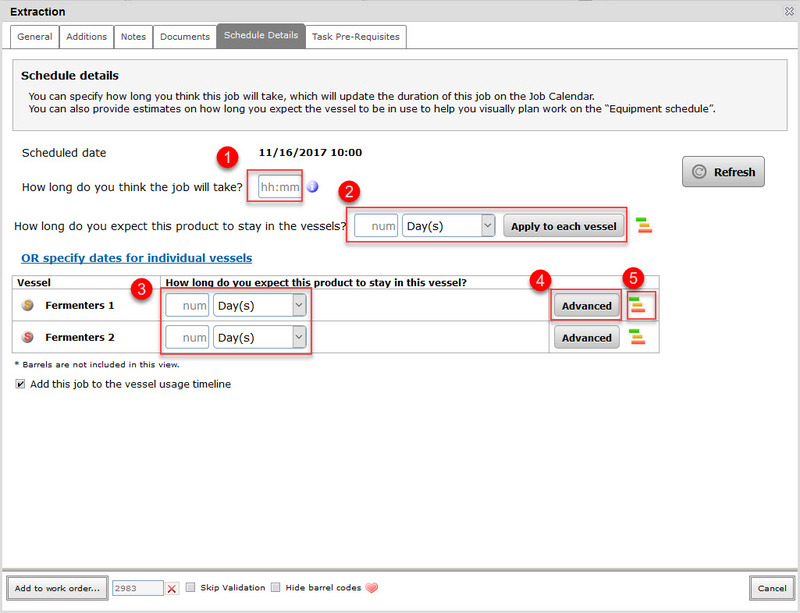 You can add tasks to any planned usage by first creating a work order for any task that you want to add. Let’s take for example you want to schedule an addition to your fermenters 1 week after the extraction. Go to File menu – Work order from writer – Add job – Multi additions. Enter the date/time you want to schedule the operation, and select your fermenters. The scheduled date/time must be within the range of the planned usage for each vessel. Click on Add to work order button and then save the work order. 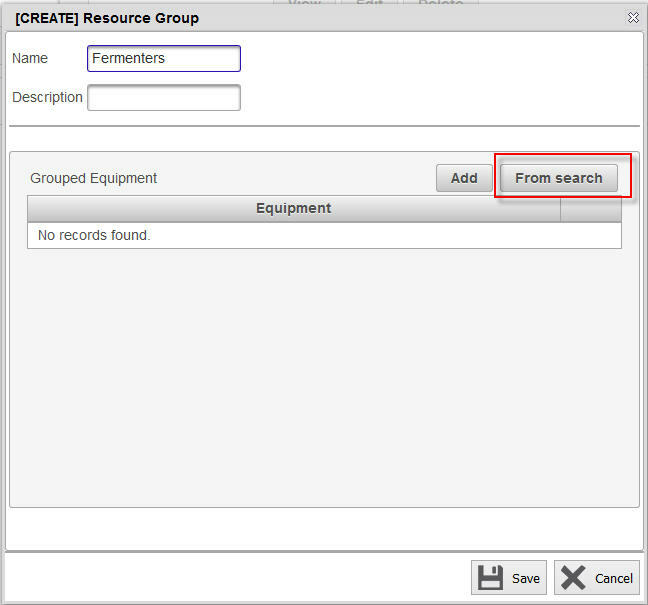 Go to the Equipment schedule console and select your “Fermenters” resource group. 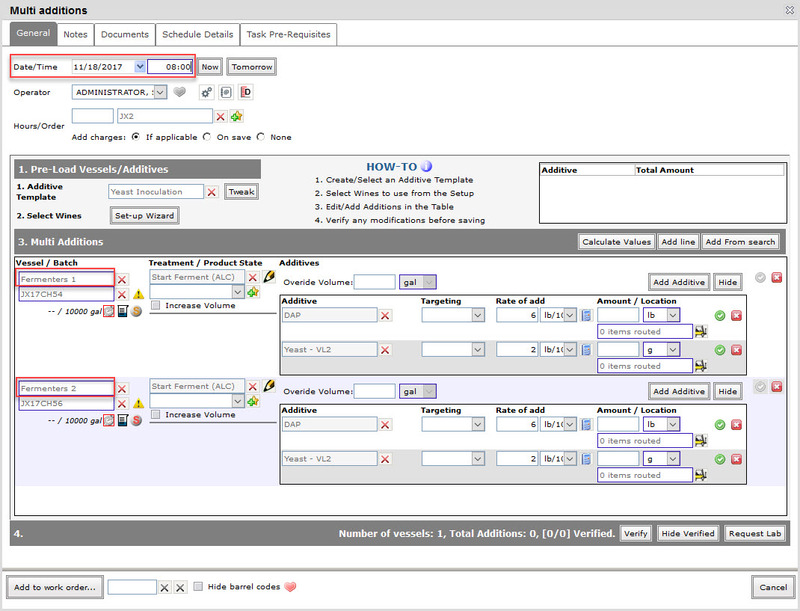 Click on any of the planned usages and you will see that the additions job has been added to it.